Best Place Visited on the Japan Tour: Trip over bridges to Matsuyama and Hiroshima. Best Experience on the Japan Tour: Staying at my friends home in Shizuoka before the trip. 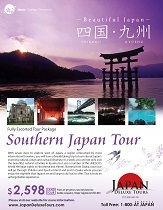 But 6 day trip with Japan tours great overall. This is my second visit to Japan. Love the politeness, generosity, and especially help that staff in hotels, shops, etc are happy to give. Hide very professional and knowledgeable and nothing was a problem to him. Always clear and concise. Always pleasant and never a problem when asked questions or describe customs and reasons for customs etc. Temples and shrines very interesting. Maybe too many.